"Five years ago, the ground shook and the skies opened: The Creator ordered and welcomed the pure souls of five members of the same family -- father and mother, two sons and a three-month-old baby. "Since that year's Parshat Vayikra, we have carried the weight of the Fogel family's memories on our poor shoulders. For five years we have known: There is a time to weep and, thanks to the children who remain, also a time to laugh. "Sadly, many names have been added to the memorial plaque, all of them with beautiful faces and kind eyes - and an evil hand holding a knife continued to cut down happy souls. "The Prime Minister takes little Yishai on his lap, the IDF Chief of Staff offers candies and an entire country sends letter. The People of Israel, schooled in agony, is on its feet and says, without words and with much action, that we must keep the hope alive. "The way is long and difficult, but we cannot give up our faith because we truly want what's best. We will not give up on the vision or on the dream. We wish to thank all those who shared in our sorrow and all those who have showered us with love. 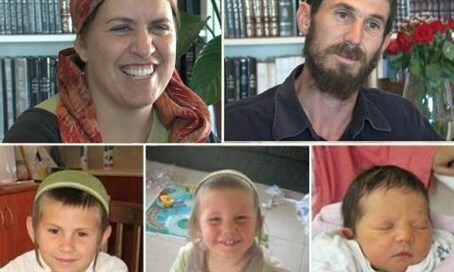 "Yehuda and Tali Ben Yishai, the parents of Ruth Fogel hy"d"
The massacre victims included the parents, Ehud and Ruth, 11-year-old Yoav, 4-year-old Elad and three-month-old Hadas. Three other siblings survived; two (one six years old and one two) were asleep in the house at the time of the attack, while 12-year-old Tamar was out with a youth group. It was Tamar who alerted authorities after coming home and finding the grizzly scene. Two people from the nearby Palestinian village of Awarta later confessed to the crime. They were convicted of murder, stealing weapons, breaking and entering, and conspiracy.